Explorers is a 1985 American science fiction fantasy film written by Eric Luke and directed by Joe Dante. The film stars Ethan Hawke, River Phoenix (in their film debuts), and Jason Presson as teenage boys who build a spacecraft to explore outer space. The special effects were produced by Industrial Light & Magic, with make-up effects by Rob Bottin. Rushed into production, the film was never properly finished. Dante revealed that the studio demanded that he stop editing and rush for a July release where it was overshadowed by the Live Aid concert, which was held one day after the film's release  and stiff competition from Back to the Future, which opened nine days prior. Despite being a box office flop upon its release, it attracted a cult following when it was later released on VHS. Ben Crandall is a young teenage boy living in the suburbs of Washington, D.C., who experiences vivid dreams about flying through clouds and over a vast, city-like circuit board, usually after falling asleep watching old sci-fi films (The War of the Worlds is a favorite). Every night, upon waking from the dream, he draws the circuit board. Ben shows the sketches to his friend, child prodigy Wolfgang Muller. At school, Ben develops a crush on Lori Swenson, but he isn't sure whether it's mutual. Both boys meet punkish-but-likable Darren Woods, with whom they share their circuit board-concepts. Wolfgang builds an actual microchip based on Ben's drawings. The chip enables the generation of an electromagnetic bubble which surrounds a pre-determined area. As the boys discover, the bubble is capable of moving at near-limitless distances and speeds without the usual ill-effects from inertia. They construct a rudimentary spacecraft out of an abandoned Tilt-A-Whirl car; they name their ship the Thunder Road, after Bruce Springsteen's song of the same title. Their experiments with the Thunder Road draw attention from the United States government, which sends agents to scout the area for UFOs. After Ben receives more dreams about the circuit board, Wolfgang discovers a means of producing unlimited sustainable oxygen; this means longer flights, whereas previously they were limited to whatever a typical oxygen tank could hold. They finalize their plan to explore the galaxy in search of alien life. The boys complete lift-off, despite interference from the authorities (one of whom silently wishes them well). Shortly after breaking Earth's orbit, something overrides the boys' personal computer-controls. The Thunder Road is tractor-beamed aboard a much larger spaceship. The boys venture out to meet their "captors", Wak and Neek: two green-skinned aliens whose knowledge of Earth comes almost entirely from junk culture, particularly television reruns. The young explorers hit it off with their extraterrestrial hosts, but then the alien ship is suddenly intercepted by a larger-still alien vessel. Feigning an attack by space-pirates, Wak urges the boys to leave. They are in the process of doing so when they're interrupted by a gigantic brown extraterrestrial, this one bearing a close resemblance to the other two, who gestures furiously while grinding out barely-comprehensible alien language. As it turns out, Wak and Neek are brother and sister; they've taken their father's ship out for a "joy ride", sending the dreams to the boys in the hopes of meeting humans. Transmissions of old black-and-white movies have kept the extraterrestrial populace at a distance – except for the curious Wak and Neek – due to the way humans generally depict violence toward alien life. Wak and Neek's father allows the Thunder Road and its crew to depart, after Wak and Neek give the boys a parting gift: an amulet which, according to the extraterrestrials, is "the stuff dreams are made of". The boys make it safely back to Earth, but a malfunction results in them crashing the Thunder Road into their neighborhood lake. Now they're back to square one...or so they think. A week later, Ben has a dream at school in which he envisions another vast circuit board while flying through more clouds overhead. This time – thanks to Wak and Neek's amulet – Ben is joined in the dream by Wolfgang, Darren and Lori. They proclaim that the circuitry is "really complicated", and wonder where this one will take them once they've constructed it. Lori smiles at Ben while holding his hand. 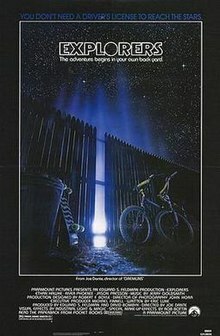 A rumor persists that the script for Explorers had been circulating Hollywood offices for years before it was made, and that it was bought by the studio because a scene of "children flying through the sky on bicycles" appealed to Steven Spielberg for his film E.T. the Extra-Terrestrial. The film was originally to be directed by Wolfgang Petersen having initially impressed Paramount executives with his family-targeted The NeverEnding Story. Petersen wanted to film it in his native Germany. The studio decided to settle in the States with an American director and Petersen was not long after commissioned by 20th Century Fox to take over the production of Enemy Mine. "The funny thing about it is that when I was first given the script, I was coming off Gremlins and in a rare point in my career I was like 'hey, let's get this guy,'" said Dante during a Q&A and screening of the film in 2008. Dante liked what he read but didn't feel there was a third act. "At the end when the kids went to the planet, they go and play baseball. That was the plot. It seemed that wasn't quite enough." While discussing the script with Paramount executives, they said "we can work on it while we're making the picture." Dante and the writer, Eric Luke, were "improvising what they were going to do" while the film was being made. Both Hawke and Phoenix make their feature film debuts. Phoenix, who had grown up in communes in South America, was somewhat unfamiliar with popular culture of North America. During rehearsals it became a running joke when he would attempt scripted well-known words and phrases and pronounce them incorrectly. Phoenix was originally considered to play Darren, but when Dante chose Jason Presson to play him, Dante thought he was good enough to play another role so he cast him against type as the nerdy Wolfgang. Cherie Currie was considered for a part but, according to her autobiography, she was in the throes of drug dependency and couldn't even make it to a meeting. "The studio changed hands in the middle of production, and they decided they needed the movie much quicker than we thought," said Dante. "So we shot the picture under very hurried auspices [sic]. The paint on the sets was literally wet and when the kids stepped into the spaceship they sunk into cement because it wasn't dry."' During the dreams when the children fly over the circuit board, some of the camera angles and moves are meant to mimic the flight to Neverland from Peter Pan. When Robert Picardo was in full makeup and costume as the aliens, Wak and his father, his mouth was the only part of him not completely covered (though his mouth was made up to blend in with the faces of the creatures). "We came up with sort of a pop culture angle on it, that we thought would be funny... audiences didn't particularly," said Dante. The film contains various references to science fiction features, new and old, and much more when the children meet the aliens. References include when the boys are hovering over the drive-in, the film that is playing stars a space hero named Starkiller, named after George Lucas' original last name for Luke Skywalker, and the sound effects from the movie are from the Atari video game Yar's Revenge. Hawke's character, Ben, is obsessed with aliens and movies surrounding them, and the two films he watches during the film are This Island Earth and The War of the Worlds. The children attend the "Charles M. Jones Junior High School", named after Looney Tunes director Chuck Jones and Wak the alien's first exchange of dialogue is of Bugs Bunny's famous catchphrase. The song Wak performs for the kids is Little Richard's "All Around the World". One character is a pet rat (trained to use a voice synthesizer) named Heinlein. While the film uses the original recording, the soundtrack album included a re-recorded remix performed by Robert Palmer. Dante and his editing team submitted a rough cut by the late spring of 1985, but Paramount wanted to take advantage of the busy summer market. They changed the initial release date of late August to early July. "They said "just stop editing the picture, we're gonna put it out, and we got a perfect date for it and we know it'll make a lot of money," said Dante. There was about an hour and a half worth of footage that was left on the cutting room floor. "There was a lot of spiritual kind of stuff in the movie that didn't make it in at all," Dante said. "There's a theory that was around at the time about the world mind and it was a concept I thought was interesting. We started to get into it and there was no way to make any sense out of it, so we just dumped all that. Now the only picture where that theory is even mentioned is Exorcist II unfortunately." Sequences had to be re-dubbed, including one near the end where the boys are under a tree, to give the film a sense of closure. The boy of the young couple in the drive-in scene where he calls the special effects "fake" is supposed to be Ben's brother. Dante says, "there was a whole family sub-plot that is completely missing." Miller's character was also supposed to return in the third act. Explorers was released on July 12, 1985 on 1,750 theaters, which turned out to be the same weekend as when the Live Aid concert was being broadcast. Back to the Future had also opened the previous week on July 3rd (Wednesday) and dominated the summer. Explorers suffered badly its opening weekend and afterwards quickly disappeared. By the end of its run in theaters, it earned $9,873,044. When the Los Angeles Times compared the film with other commercial failures that summer, a Paramount executive responded, "here was a wonderful piece of material. But by the time it came out, you felt as though you'd already seen it." Many of the international markets released the film later in December of the same year. The film fared better in video rentals and cable broadcasts and garnered positive reviews from critics. Kevin Thomas of the Los Angeles Times said, "Explorers" itself is bubble-thin, but it glides by gracefully on the charm of its three young heroes and their vividly envisioned adventure in space." "Of all the Spielberg-inspired fantasy films afoot at the moment, Explorers is by far the most eccentric. It's charmingly odd at some moments, just plain goofy at others," said Janet Maslin in her review for The New York Times. The film currently holds a 77% rating on Rotten Tomatoes, based on 26 reviews, with an average rating of 6/10. The site's consensus states: "With a terrific young cast (including Ethan Hawke and River Phoenix) and some typically energetic work from director Joe Dante, Explorers soars past its '80s kiddie flick competitors with wit, good-looking effects, and tons of charm." Over time, Explorers has gained a cult following among fans of Dante's work, as well as science fiction fans and those who feel it is an overall family-friendly film. Dante reflected on the film by saying that he is appreciative of the warm reception it has earned over the years, but continued by saying "the problem is for me is that the movie you'll see is not the movie I wanted to make. It's the movie I got to make up to a certain point and then had to stop. It's hard for me to look at it, cause it's not the film I quite had in mind." The missing and cut scenes are presumably lost, as Dante tried searching for them in recent years[when?]. Some of the home video releases would be slightly recut to remove two scenes, where Wolfgang has an encounter with Steve Jackson and his gang of bullies and a brief bit where the boys chase the Tilt-a-Whirl ride after they push it up a hill. These two scenes were reinstated when it was added to Netflix. A brief sequence at the end where Ben daydreams about the Thunder Road ship restored and in the classroom was also added in some of the home video releases. Originally before the end credits, in the theatrical cut, the alien Wak "broke the fourth wall" and remarked on people who were still in the theater from the smell of popcorn. In the re-edited home video version, he just tells another joke before it cuts to the closing credits. A novelization of the film was written by George Gipe. The film's original score was composed and conducted by Jerry Goldsmith. An album was released on MCA featuring selections from his score plus three songs (including "All Around the World" as performed by Robert Palmer - the Little Richard version is heard in the film). The album was later reissued by Varèse Sarabande with the score and songs separated. In 2011, Intrada Records released the complete score. According to The Hollywood Reporter, Paramount is developing a remake of Explorers through their low-budget label Insurge Pictures written by Geoff Moore and Dave Posamentier and produced by Josh Appelbaum and Andre Nemec. The remake is said to be similar in tone to the Michael Bay-produced Project Almanac. Deadline report that Cary Fukunaga and David Lowery are working on the pilot for a new adaptation of the film. ^ "EXPLORERS (U)". British Board of Film Classification. July 19, 1985. Retrieved December 26, 2015. ^ "Disasters Outnumber Movie Hits". Sun-Sentinel. 4 September 1985. Retrieved 5 June 2012. ^ Goldstein, Patrick (19 May 1985). "'Explorers'--Racing to the box office". Los Angeles Times. ^ a b "Explorers (1985)". Box Office Mojo. Retrieved 4 April 2014. ^ Glorieux, Thomas. "Jerry Goldsmith: Explorers". MainTitles.net. Retrieved 4 April 2014. ^ Erickson, Glenn (19 October 2004). "Explorers: DVD Talk Review". DVD Talk. Internet Brands. Retrieved 17 June 2013. ^ Currie, Cherie (16 March 2010). Neon Angel: A Memoir of a Runaway. New York City: HarperCollins. ISBN 0061961353. Retrieved 4 April 2014. ^ Explorers (1985) Trivia Wolfgang's "talking" rat is named Heinlein, after science fiction author Robert A. Heinlein, who wrote many stories about young boys experimenting with spaceflight. ^ "Explorers Movie Trivia". fast-rewind.com. Retrieved June 16, 2013. ^ Friendly, David T. (6 August 1985). "A Summer of Discontent at the Box Office". Los Angeles Times. Retrieved 5 June 2012. ^ Thomas, Kevin (12 July 1985). "Movie Review : Gentle Dreams Of 'Explorers'". Los Angeles Times. Retrieved 5 June 2012. ^ Maslin, Janet (12 July 1985). "The Screen: 'Explorers'". The New York Times. Retrieved 5 June 2012. ^ "Explorers (1985)". Rotten Tomatoes. Flixster. Retrieved December 27, 2015. ^ "Top 11 Underrated Nostalgic Classics". The Nostalgia Critic. Retrieved February 28, 2011. ^ "The Top 10 Cult Films of the 80s". TheVine.com. Archived from the original on July 6, 2011. Retrieved February 28, 2011. ^ Frank666 (10 November 2010). "Explorers (Comparison: DVD-VHS)". Movie-Censorship.com. Retrieved 4 April 2014. ^ Gipe, George (1985). Explorers: A Novel. London: Severn House Publishers. ISBN 0727812785. Retrieved 4 April 2014. ^ Kit, Borys. "Paramount to Remake 'Explorers' (Exclusive)". The Hollywood Reporter. Retrieved 12 March 2014. ^ Fleming Jr, Mike. "Cary Fukunaga & David Lowery Turning 1985 Film 'Explorers' Into TV Pilot At Paramount Television". Deadline Hollywood. Retrieved November 6, 2018. ^ Greene, Steve. "'Explorers': Cary Fukunaga and David Lowery Working on TV Pilot Based on the Joe Dante Film". IndieWire. Retrieved November 6, 2018. This page was last edited on 5 April 2019, at 18:26 (UTC).